Evictions are hard not only for the tenant but also for the landlord. While the tenant faces the possibility of not having a place to live, the landlord loses out on a monthly source of income. However, since the tenant faces a much more serious problem, the eviction process is generally made to favor them. 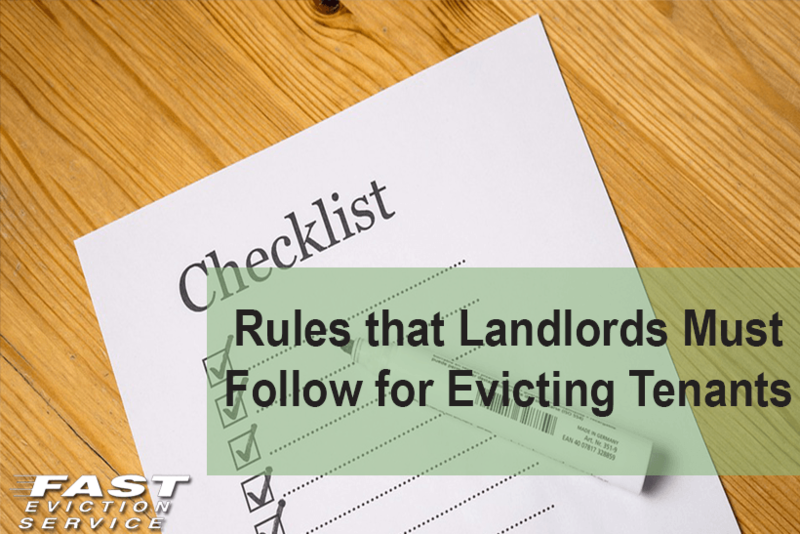 It is the responsibility of the landlord to follow a very strict procedure and set of rules to get the tenant evicted. If you fail to follow the rules and state laws to the letter then there is a chance that you might lose your case against the tenant. Each state has its own eviction laws but there are some landlord rules that are applicable everywhere. Before you can even think about evicting a tenant, you will have to serve him/her an eviction notice first. This notice is going to explain the reasons why you want to evict the tenant. The grounds for eviction of a tenant are different in different states so make sure that your eviction notice complies with your state’s eviction laws. There are three types of notices that you can serve your tenant depending on the situation you find yourself in. This notice is served if the tenant hasn’t paid rent for a long period of time. When serving such a notice it is compulsory for you to give the tenant some time to pay the rent typically ranging from 3-5 days. If the tenant doesn’t pay the rent till this time then you are illegible to file an eviction lawsuit against him/her. This notice is usually served if the tenant is somehow violating the terms of tenancy contract. Common violations include bringing a pet into the home whose entry is forbidden in the agreement, damaging the property in any way or making excessive noise. Such notice also come with a curing time period of 3-5 days in which the tenant can make amends or face eviction. An unconditional quit notice does not require the landlord to explain the reasons why he wants to terminate the tenancy agreement. Moreover, such notices don’t give the tenant any time period to fix his/her wrongdoings and requires them to vacate the premises immediately. This notice can only be served if the tenant has been violating the tenancy agreement for a long period of time, has been late in paying the rent for several months or has been found guilty of engaging in unlawful practices like drugs. A full list of free Eviction Notice Forms is available on this website along with the frequently asked questions about how to serve an eviction notice, how long does it take to evict a tenant and how much does it cost to evict someone.